Un-certainly Employed Workers Must Keep Their Parachutes Packed! All workers need their job recovery parachutes packed at all times, especially those anticipating a layoff. This is the only way to have job security in a troubled job market. 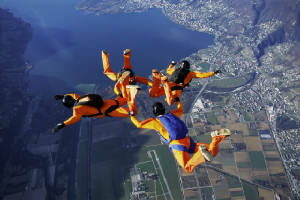 A parachute that is packed properly before the word comes of a layoff will prevent the sudden emotional fall and subsequent confusion that comes when the layoff occurs. Having a job search parachute packed is not disloyal to your company. It is just insurance against losing valuable time in the job search due to lack of direction and losing good job opportunities due to poor preparation for job interviews. Taking any job that comes along when on the rebound of losing a job can be devastating if the company and job fit are wrong. This is manifest early on in the new job and often results in early termination. Knowing where you best fit in the job market is the only way to know determine the right job and company that fits you. Career Focus Workshops can help you pack your parachute while you are still employed to insure a soft landing which will allow you to hit the ground running in the job search. It helps you define your problem solving skills with success stories to back them up. It helps you identify companies that fit you and your style. Then you can set up contacts inside the good companies to keep you informed on inside opportunities.